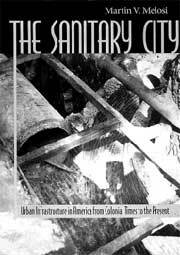 this monumental book is a fascinating analysis and documentation of the development of urban sanitation infrastructure in the us . It takes one through an illuminating journey spanning almost 500 years from the urban epidemics of the early 1500s to the debates around waste incinerators in the 1980s and beyond. Seen through the eyes of an urban historian, it has immense contemporary relevance to the emerging Indian urban landscape. City planners here could learn many lessons about 'what-not-to-do' in urban planning. The book is structured chronothematically in three sections: it deals with themes of urban sanitation such as water, sewage and solid waste and changing responses to them based on observations over three eras. The first section, titled 'The Age of Miasmas' from before 1830s ('Colonial Times') to 1880 deals with the adoption of sanitation concepts in the us and realisations about their connection with health as well as the inception of centralised water distribution systems. The second period 1880 to 1945 investigates the new advances in bacteriology and its impact on approaches to public health thinking and technologies. The third section, 'The New Ecology', links to contemporary times 1945 to 2000 and brings the reader into current health and environmental concerns and debates. The book goes beyond a documentation of facts or a citing of case studies. It holistically traces the interactions between evolving systems of urban sanitation, technology and their impact on the process of decision-making in a city's development. It deals with the combined impact of water supply, wastewater and solid waste disposal systems providing an overall view of urban services per se. In early times, sixteenth century urban America was faced with crippling epidemics with little awareness of their causes. Over the next 100-odd years, there was the development of rudimentary community-based waste supply systems with basic distribution networks, but no waste disposal. Sanitation technologies and approaches, influenced by the English 'sanitary idea', post 1830 started with a primary emphasis on water supply and to some degree sewerage. The 'bacteriological revolution' in 1880 provided tools for combating epidemics and immunisation, but did not as yet value community environmental sanitation as key to public health, since the emphasis was still on the individual per se rather than the person as a citizen. In contemporary times, post World War ii , ecological understanding grew beyond mere biological pollution to industrial pollution and its toxicity. The changing environmental knowledge catalysed technologies as well as decision-making processes. Urban spaces were being locked by infrastructrual shortages, solid waste was increasing along with a decrease in landfill space and new environmental implications were emerging, areas which earlier methods were incapable of addressing effectively. Importantly, the author explores in detail the distribution of water as primary and central to the development of urban services. Other services like sewerage and waste disposal came much later, even though waste littering was banned in Amsterdam, the Netherlands, as early as 1657. This became important in the general urban environment only about 200 years later. Water pumps and cast iron water pipes became the key to water distribution. They marked a move away from public wells and aqueducts, which could transport water to a city but not distribute it to individual homes. Privatisation of distribution through water companies followed alongside, with the incorporation in 1619 of the New River Company in London. Providing water to the pavements did not automatically result in faucets and household plumbing, especially for poorer localities. "Philadelphia, as the pioneer in waterworks, was the first to discover that to bring a water pipe to the sidewalk was still a long step from installing taps, toilets, or tubs inside the houses. For the urban poor, a generation or more elapsed before owners of slum properties installed plumbing," writes the author. The metering and chlorinated filtering of water and the development of large reservoirs and dams followed as a 'municipal enterprise'. The massive increases in piped water naturally led to the wastewater disposal problems. Cesspools were not acceptable nor were river dumping of untreated sewage. The public sewer came into being. Responses changed from dilution of sewerage to allow running water to cleanse itself, to sewage farming for converting wastewater into a valuable produce and finally to graded filtration. Chemical precipitation too was employed for sedimentation as well as for biological processes. However, only in the early twentieth century were underground sewers widely accepted. Public refuse was the next focus but not before 1880. Household wastes, horse droppings, street sweepings and rubbish were littering streets. Solid waste was increasing with rising urban populations, and also Americans were consuming more and more. Organic waste, paper, cans, old shoes, human and animal excrement, ashes were lumped together and dumped commonly on vacant land and protesting poorer neighbourhoods. Feeding to pigs and dumping into water raised public outcries since they contaminated consumable products. All this evoked a civic response with women taking a lead. However, the 'Clean City' campaigns did not have lasting impacts in the absence of adequate civic institutions. Between 1885 and 1908, there were over hundreds of waste incinerators, but the resulting incomplete combustion and emissions of 'noxious smoke' discounted their effectiveness. The first waste-to-energy plant was installed in New York City in 1905. By the late 1980s, however, community pressure had begun to close them down because of fears of toxicity, in particular dioxin releases, and push for material recovery or recycling and reuse approaches. Municipal waste being incinerated came down from a peak of 40 per cent in 1915 to a less than 15 per cent in 1995. New legislation such as the Resource Conservation and Recovery Act (rcra) brought environmental bureaucracies (such as the Environmental Protection Agency) and federal governmental roles in the garbage loop. In many ways, the scenario being played out today in Indian urban management is akin to the phases described in the book. The lessons of the social and economic impacts of centralised systems, new interfaces with environmental concerns and the uncompleted western project of the sanitary city should make us sit up and adopt better responses instead of going down the unaffordable path of the West. In the next 25 years, we are going to approach 40 per cent urbanisation, which means a mind-boggling 400 million people. Besides our large cities, the new and burgeoning smaller ones, big by any international standard will probably be worse off. Sadly, the response of the urban planner to the exploding urbanisation in India has been extremely poor. Blindly adopting the systems of the West, out of context of their development dynamics, has led to situations such as the current confrontation between various sections of the citenzery in the capital city of Delhi. Without adequate civic representation, urban planning here has been largely class biased. Poorer citizens have to fight for one tenth the amount of water available to their affluent counterparts, are surrounded by open drains and cesspools and decaying waste. Environmental and health responses have not been woven into urban planning and land use. There is a blind faith on relying on cast out technologies disregarding the implications and even at the expense of social systems being disrupted. Why else would Indian municipalities favour investing multimillion rupees in incinerators, putting at risk the recycling sector rather than adopt low end composting? Or, installing common effluent treatment plants with no hazardous sludge disposal and without adopting newer cleaner technologies? The cost of centralised sewerage and water distribution is astronomical, with a majority of our cities not even connected to either type of pipe. We have to learn lessons from other countries. The main one being that we must develop our own specific responses and provide them space to evolve. Importing systems out of sync in the local context has been disastrous. Decentralised waste management, safer, non-combustion technologies for its treatment and disposal, recycling, water harvesting, and energy efficiency are the only future for the exploding urban cities in India. The Sanitary City for us yet remains a dream.